As the founding partner of Wilson, Wade has dedicated almost thirty years to providing trusted tax services to international investment funds, businesses and individuals. 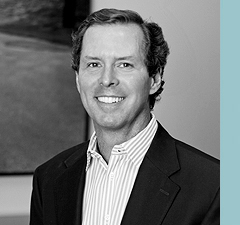 In his early years at Ernst & Young, Wade quickly developed adeptness in partnerships and real estate while working within the Entrepreneurial Services Group. He also developed an affinity for computers and technology, creating his first accounting database in 1984. He went on to combine his tax and computer skills to pioneer custom accounting applications. After several years developing specialized software, cultivating tax compliance expertise and refining his international experience; Wade founded Wilson, LLP. He earned a Bachelor of Business Administration in Accounting from the University of Georgia, and then became a certified public accountant. He also credits much of his business success to his father—a man of charm and professionalism—who had the foresight to urge Wade to start his own business, and teach him the value of a client. Those same core principles set Wilson apart from its competitors today. By building a foundation that combines collaboration and trust with technology and global tax expertise, Wade's leadership supports continued growth within the firm, and promotes valued, long-term, client relationships. A self-proclaimed hobbyist, Wade enjoys continued learning both professionally and personally. Wade is an avid cyclist, former triathlete, and current world traveler. He and his wife of over thirty years have explored Europe, Southeast Asia, Australia, and South America. For all their international travels, they also enjoy relaxing closer to home at Lake Burton. Wade and his wife Barbara have three grown children, two of which have recently married. At the office, Wade leads the Wilson partners in providing tax compliance and advisory services for businesses, individuals and partnerships as well as specialized international tax services. He continues to build long-term relationships and expert solutions for international real estate investment funds. He's created a firm where every client will deal directly with a full partner, getting big firm talent without paying the Big Four price. It's his belief that this is the business model of the future—an elite team of experts with specialized technology that provides scalable solutions.